Matriculation from a Govt. recognised Institute with valid Mining Sirdar’s Certificate of Competency from DGMS under CMR (for Coal Mines), along with valid Gas Testing & First-Aid Certificate. Post qualification experience of at least 1 (one) year. Candidates should be in good physical and mental health and should be able to perform his job effectively. Medical standards stipulate minimum requirements of Weight: 45 kg (male) / 35kg (female); Height: 155 cm (male) /143 cm (female); Chest measurement: 75cm & 79 cm on expansion (male) / 70 cm & 73 cm on expansion (female); Distant vision: 6/12 with or without glasses and above 35 years one step relaxation. For employees already on the job and above 35 years one line relaxation may be considered; near vision: J1 or N6 both eyes. Power of glasses should not exceed +4.0D; Colour vision: Normal in Lantern test with maximum aperture; Binocular vision: Essential. Surgically operated and corrected squint will be acceptable; Night blindness should not be there; Hearing: Normal (Relaxable upto 30 db in speech frequency). The mode of selection shall be the through Written Test and Skill Test / Trade Test. Eligible candidates will be required to appear in the Written Test. Candidates will be short listed on the basis of their performance in the Written Test and will be required to appear in the Skill Test / Trade Test. Candidates will be called in the ratio of 1:3 for each post. Weightage for selection would be 100% based on the marks obtained in the written examination. Skill Test / Trade Test will be of qualifying nature. Date, Time & Place of the Written Test and Skill Test / Trade Test will be intimated to eligible / shortlisted candidates through e-mail / SAIL website www.sail.co.in. 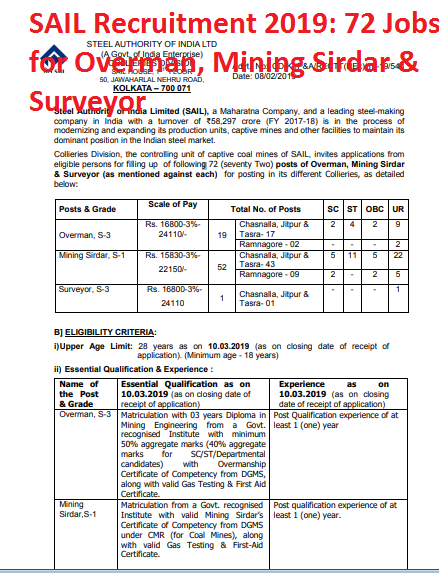 All appointments in the post of Overman, Mining Sirdar and Surveyor shall be placed directly in S-3, S-1 and S-3 grade respectively. The selected candidates on joining the Company will be under probation for a period of 01(one) year. The emoluments for the above mentioned posts of non-executive category in the substantive grade (S-3/S-1) will include Basic Pay (in the scales of pay revised for non-executives w.e.f. 01.01.2012), Industrial Dearness Allowance [AICPI-198, Base 2001=100], reimbursement of local travelling expenses and other facilities such as medical facility for self and dependant family members, company accommodation as per availability, Provident Fund, Gratuity( as per ceiling prescribed under payment of Gratuity Act, 1972), LTC etc. as per rules of the Company. House Rent Allowance will be paid only where Company Accommodation is not available. Eligible and interested candidates would be required to apply online only through SAIL‟s website www.sail.co.in at the link “Careers”. No other mode of application shall be accepted. To apply, candidates may click at the link of the post applying for and submit information online in the appropriate fields. Before applying the candidates should ensure that they fulfill all the eligibility norms as per the advertisement. Their admission at all stages of the examination will be purely provisional, subject to their satisfying the prescribed eligibility criteria, which will be verified at the time of Skill Test / Trade Test. Mere issue of Admit Card / Call Letter for Skill Test / Trade Test will not imply acceptance of candidature. Candidature of a registered candidate is liable to be rejected at any stage of selection process or even on joining, if any information provided by the candidate is found to be false or not in conformity with the eligibility criteria at any stage or if the candidate fails to produce valid documentary proof in support of his eligibility. Possess a Valid e-mail ID and Mobile No., which should remain valid for at least one year. Pay in Slip (SBI Challan) of ₹ 250/- or ₹ 150/- (as applicable for the posts specified at point no. H above) as Application fee for General/OBC candidates. SC/ST/ExSM/Departmental Candidates are exempted from payment of Application. The Pay in Slip is to be downloaded from the website after filling in the required details. Candidates should have latest passport size coloured photograph as well as photograph of own signature in digital format (.jpg or jpeg file only, each less than 500 kb size) for uploading with the application. While submitting the application online, candidates should note that Category (General/SC/ST/ExSM/OBC) once submitted in the application cannot be changed and no benefit of other category will be subsequently admissible. While applying the candidates should enter their full name as it appears in the Matriculation Certificate. In case of change of name at a later stage, necessary documentary proof to be submitted at the time of Skill Test / Trade Test. After applying online, the candidate is required to download the system generated Registration Slip with Unique Registration Number and other essential details and retain a copy of the same. Candidates are not required to send any document to Collieries Division at this stage. The candidates will be allowed to appear in the Written Test only if they possess the valid Admit Card with Photo Identity which will be available for downloading from the SAIL website. However, candidates shortlisted for Skill Test / Trade Test would be required to furnish documents regarding proof of date of birth, qualification, experience, category etc. at the time of Skill Test / Trade Test. While filling the online application, candidates must carefully follow all the steps. Incomplete application/ application without fee (where applicable) / application not fulfilling any eligibility criteria will be rejected summarily. No communication will be entertained from the applicants in this regard. State Bank of India (SBI) has been authorized to collect the application fees in a specially opened Account (No. 32469839252) at SBI, CAG Branch, Kolkata, on behalf of SAIL-Collieries Division. Candidate has to approach any State Bank of India branch (having Core Banking facilities) with a printout of the “SBI challan” which is available on the Application Registration Portal. The SBI challan printed from the portal only should be used for depositing the fee for proper crediting of amount in the allocated account. Candidates should retain a copy of the bank challan with them. On receipt of the money, the concerned branch of SBI will issue a unique Journal Number and the Branch Code of the Bank. The Journal Number and the Branch Code are to be filled up by the candidate during online registration. Also, please note that the candidate will have to bear the Bank Charges of certain amount to be paid to the collection branch of SBI in addition to the applicable Application fee. The SBI branches will accept the fee during banking hours from the starting date to the closing date of submission of online application. Fee shall not be collected by any other mode. In case a candidate deposits the fee in a wrong account, or doesn‟t finally submit the application form with payment details, Collieries Division will not be responsible. Fee once paid will not be refunded under any circumstances. Candidates are therefore requested to verify their eligibility before paying the application fee and to fill in the payment details carefully. After ensuring the correctness of the particulars of the application form, candidates are required to pay fees through the payment gateway integrated with the application by following the instructions available on the screen. No Change/ editing will be allowed thereafter. On successful completion of the transaction, Registration slip with Unique Transaction Number and Application Number will be generated, which must be printed out for record. If the candidate does not receive the registration slip with unique transaction number, his/ her application will not be considered complete and he/ she will have to make payment again. Failed transaction amount will automatically be refunded to the same account from which payment was originally made, within seven working days.